We have so far brought you many a tale about various Gods, Goddesses, Kings, Queens, warriors and so on, who have been known and immortalized for their gallant or great deeds. This month, we go down a different route, to bring you a story of a prince; who was known for; rather turned out to be infamous for; some of his unpalatable exploits. A point to be noted here is that, in Indian mythology, no legend or tale exists without reason. There is always some purpose behind a story and a hidden meaning or lesson that we can learn from. In this instance too, the main character; an anti-hero of sorts; came with a clear mission that he himself was unaware of. Certain people come to this earth in order to destroy the existing state of the world, so that a better world can be created after their time. Such is the tale of our central character, Samba, a lesser-known son of Lord Sri Krishna. Samba was one of the sons of Krishna, born to Jambavati. He was the half-brother of Pradyumna, who was much better known. The birth of Samba is described in detail in the Mahabharata as well as the Devi Bhagavata Purana. Jambavati was unhappy about the fact that she could not bear any children to Krishna, while all of his other wives had many children with him. One day, she approached her husband and pleaded with him to bless her with a son as handsome as Pradyumna, who was Krishna's first-born son from his Patrani (main wife), Rukmini. Krishna then left for the Himalayas, to visit sage Upamanyu. There, he was advised to pray to Lord Shiva. Accordingly, Krishna undertook severe penance and austerities to attain the grace of Shiva. For one entire month, he held a skull and a rod during his penance. During the second month, he stood on one leg and survived only on water. The third month, he stood on his toes and did not touch food or water. 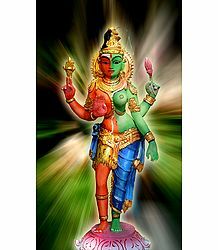 Finally, Shiva appeared before him in the form of Sambashiva, his half-male, half-female, Ardhanaareeshwara form. Pleased with Krishna, he told him to ask for a boon. Krishna sought a son from Jambavati and it was instantly granted. Soon after, Jambavati gave birth to a son – they named him Samba, as he was born due to the grace of Lord Sambashiva. Jambavati then went on to have many children after Samba. 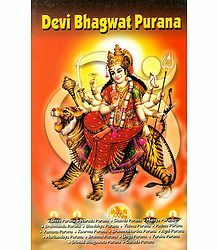 The Bhagavata Purana relates that, after giving birth to Samba, she gave birth to sons and daughters, including Sumitra, Purujit, Shatajit, Sahasrajit, Vijaya, Chitraketu, Vasuman, Dravida and Kratu. Krishna wanted his son Samba to be exactly like Shiva. Now, each of the Divine Trinity of Brahma, Vishnu and Shiva has a function to perform. While Brahma's purpose is to create the universe and Vishnu's, to maintain the same, Shiva's main function is to destroy. The boy Samba, therefore, ended up being the cause for the destruction of the entire Yadava race. It is said that, Krishna, being the Supreme Power, already knew what was coming and was well aware that the Yadus could not be defeated by anyone. He knew it was time for the Yuga (epoch) to come to an end and so, he brought his son Samba into this world, in order to destroy the clan. Samba grew to become a very handsome prince. However, he was constantly causing some trouble or the other and was always harassing people, thereby earning a very bad name for himself. In the meantime, Duryodhana's beautiful daughter, Lakshamana, came of age. Her family decided that it was now time to conduct her swayamvara, a ceremony, wherein she would be presented many kings and princes from various states. She would have the freedom to choose her own future husband from these participants. A great many kings and princes attended the ceremony, each hoping that they would be able to win the graceful damsel's hand in marriage. Samba was also present at the ceremony. However, instead of waiting to see if she would place the varmala (groom's garland) around his neck, he abducted her by force and took her away, right in front of the shocked crowd. This enraged everyone present there. Duryodhana's family, in particular, was outraged and embarrassed by this turn of events. They all got into their own chariots and chased Samba. He was finally caught and arrested in the kingdom of the Kauravas. Meanwhile, Lakshamana's family members asked her to choose someone else from the elite gathering of rulers and princes. The poor princess was already very miserable after the public humiliation that she was subjected to. Besides, deep down in her heart, she had a liking for the rash and rowdy Samba. Considering her obvious discomfort, the participants suggested that the swayamvara be postponed to another day. Lakshamana's family agreed to that and decided to hold the ceremony at a later date. All the hopefuls returned to their respective kingdoms and Samba was kept in jail, where he was treated very badly and was humiliated in every way possible. The news of the capture eventually reached Krishna's ears. Considering his son's heinous crime and also the fact that the Kauravas were his worst enemies, he decided not to rescue Samba. Krishna's brother, Balarama, was extremely fond of his nephew. He decided to bring him back from the Kauravas' kingdom. He approached Duryodhana and requested him to release Samba from prison. Seeing this as a good opportunity to get back at Krishna, Duryodhana and his brothers began to taunt Balarama, poking fun at their closeness. Duryodhana then flatly refused to release the prince. This incensed Balarama, who used his weapon, the plough, to break down the walls of the prison. He further destroyed all the soldiers who tried to stop him in his tracks. The Kauravas were alarmed seeing Balarama's sheer power and quickly released Samba. Not satisfied with his nephew's release, Balarama demanded that Lakshamana be wedded to Samba. Duryodhana knew that, if he did not accede to Balarama's demand, the latter would destroy the entire kingdom. Hence, he gave the matter due consideration and then let his daughter leave with Balarama. He did not even ask his daughter her opinion before giving her away. However, Balarama already knew that she secretly loved Samba and was happy with the way things were turning out for his dear nephew. As dowry, Duryodhana gave his daughter thousands of horses and chariots and hundreds of strong elephants. Balarama then returned to Dwaraka, Krishna's kingdom, along with Samba and Lakshamana. Krishna was happy to welcome the beautiful princess as his daughter-in-law. 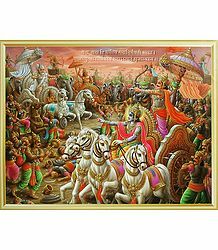 Krishna, the Pandavas and the Kauravas were essentially Kshatriyas – they belonged to the warrior caste. In this society, it was acceptable to abduct a bride, though it was generally done only with the mutual consent of all the parties involved. Arjuna had similarly abducted Krishna's sister, Subhadra, and had married her with his consent. Balarama had initially been furious with Arjuna, but Krishna had intervened and made him understand how much Arjuna and Subhadra loved each other; and how having a brave warrior such as Arjuna would prove to be an asset to their family. Lakshamana too was happy at the turn of events, as she had loved Samba for a very long time, but was unable to tell anyone about it. Soon enough, they both settled down into happy married life. Samba could not rest quietly even after being married – he continued harassing and troubling others around him. Once, three great sages decided to visit Krishna's palace in Dwaraka. Krishna, who was resting at that time, told his attendants that he would be there shortly and; in the meantime; asked them to welcome the sages with full respect and devotion. Samba heard of the sages' arrival and he, along with some of the other young relatives present in the palace, decided to play a practical joke on the rishis. Samba tied a large Gada (iron bolt or mace) on his stomach and draped a saree. He then approached the rishis along with these men, who told them that this woman was carrying and asked them to predict whether the child would be a boy or a girl. Now, these rishis were self-realized and hence, immediately knew that they were being mocked at. Enraged, they told Samba they were well aware of his identity and cursed him that he would give birth to a Gada (iron bolt or mace). They further said that this mace would eventually bring about the destruction of the entire Yadava clan. At that moment, Krishna entered the hall and was saddened to hear about the incident and that the sages had placed a curse on his son. He, however, knew that Samba and his relatives fully deserved to suffer. The rishis too felt bad after uttering this curse, but had no power to take it back. In spite of the unfortunate incident, Krishna spent time with the sages and spoke to them with utter respect. After a while, they took their leave and departed, after taking the Lord's blessings. In due course of time, Samba gave birth to a huge iron bolt. Realizing that the curse was working and fearful that their end was probably nearing, Samba and his young relatives went to Krishna and begged him to save them. Krishna thought for a while, scolded Samba for his crude and irresponsible behavior and advised him to visit King Ugrasena, who would have a solution for them. The King asked him to powder the iron bolt and then cast this powder into the Prabhas Sea. Samba and his young friends started grinding the mace, but, finding it too tedious a task, threw it into the sea, without fully grinding it. In time, this powder grew along the sea shore, in the form of eraka grass. Many months later, the Yadavas created iron clubs made out of this eraka grass and used these as weapons. Samba was extremely handsome and so, had quite a huge female following. According to the Bhavishya Purana, the Skanda Purana and the Varaha Purana, some of Krishna's junior wives were very attracted towards him. One wife in particular, called Nandini, decided to entrap Samba. She disguised herself as his wife and, coming up silently from behind, embraced him. 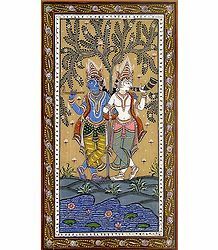 Infuriated by this incestuous behavior, Krishna cursed Samba that he would be inflicted with leprosy; also that his wives would be abducted by the Abhira clan of bandits, after his time. The Samba Purana relates how the young man suffered due to leprosy. He visited sage Kataka, who advised him to pray to Suryadeva (the Sun God) to heal his disease. 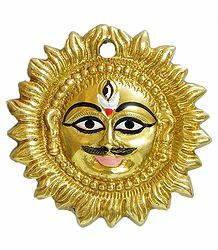 Accordingly, he constructed a temple dedicated to the worship of Surya, in Mitravana, on the banks of the Chandrabhaga. There, he underwent severe penance for a period of twelve years, after which Suryadeva appeared before him and cured him of his ailment. In all, he is said to have constructed twelve temples dedicated to the Sun God, spread across the Indian subcontinent. Both the Konark Sun Temple and the Multan Sun Temple have been attributed to Samba. In order to commemorate this legend, the State of Odisha celebrates the 10th day of the Shukla Paksha of Pausha Masa, as Samba Dashami. On this day, mothers visit the temple to pray to Suryadeva for the health of their children. Meanwhile, Krishna's relatives had experienced the luxuries of living in his palace and were only interested in drinking and indulging in all other vices. They were regularly quarrelling and fighting with each other – the palace lost all its peace and charm and Krishna no more wanted to stay on there. Later, at a festival, a bitter fight broke out between the relatives – they used their weapons to kill each other, thus ending the entire clan of Yadavas. A piece of this same iron bolt fell into sea and was swallowed by a fish. This fish was caught by a hunter called Jara. He applied it to the tip of his arrow and left on his hunting trip. At that time, Krishna was resting in the woods, leaning against a tree, stretching his feet in front of him. Mistaking the tip of his left foot for the ear of a deer, Jara shot his arrow at it, critically wounding him. When Jara realized his folly, he was inconsolable and begged for the Lord's forgiveness. 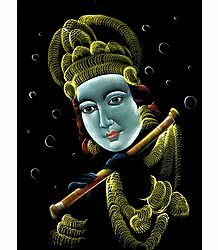 Krishna consoled him saying that this was not his fault and that it was all predestined. He then went on to narrate how this was actually Gandhari's curse, taking effect. During the battle of Kurukshetra, the Pandavas killed all of Gandhari's hundred sons. This left her completely heartbroken. Knowing that the Pandavas had won only because of Krishna's strong support, she cursed Krishna that he would have to endure the selfsame suffering that she went through – that he would also have to witness his own relatives fighting among themselves and eventually killing each other. Krishna begged her to understand that he was not the cause of the war and that he never wanted all this to transpire. However, Gandhari was firm and accused him of meddling with justice, siding with the Pandavas and finally, destroying her whole family. She reiterated that his entire clan would be wiped out because of his unwillingness to stop the war, in spite of the fact that he, being God, could have prevented it. Sure enough, Krishna had to witness the Yadavas' downfall and ultimate decay of the clan. His own departure from this world was the consequence of Gandhari's curse. However, he knew that what was destined had to be and so, gracefully accepted the end of his avatara's tenure in this mortal world. Not all of Krishna's offspring were famous – Pradyumna was the most well-known son of Krishna. Most others faded in front of his luminous personality. Samba, though not very popular, did not entirely fade out into history. His notoriety and the general perception that he was adharmic (unrighteous) were the main reasons behind his disrepute. Here is a roundup of this interesting character and his role in Indian mythology. When Krishna had prayed to Shiva for a son from Jambavati, he had wanted his son to be just like him. Hence, Shiva himself, in the form or Samba, was born to Krishna. Besides, he was also the son of Jambavati, the daughter of the mighty Jambavan, the King of the Bears. Obviously then, Shiva had a clear mission to fulfill, when he came manifested in human form. Samba had no part to play in the Great Kurukshetra War. However, since he was an aspect of Shiva himself, he was very strong and determined. He helped the Yadavas fight and capture many kingdoms, thus expanding the reign of the Yadava clan. The Yadavas were, in fact, demigods, manifested to support Krishna. That is why the entire clan was invincible. However, since the end of the Yuga was nearing; also because Bhoomidevi (Mother Earth) was being excessively burdened by their presence; Krishna had to find a way to destroy them. In order to achieve this, the Lord created Samba, knowing that only his own son would be powerful enough to perform such a task. When Samba abducted Duryodhana's daughter, he made it difficult for them to capture him. Though they hated him for it, they also admired him for his strength and daring. By receiving the sages' curse, Samba actually received the iron bolt – the very weapon that would help him end his own race; thereby fulfilling the purpose of his birth on this earth. 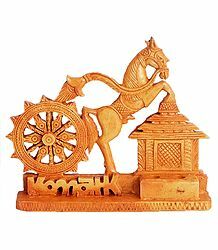 Samba gave us the famous Konark Sun Temple and the Multan Sun Temple. But for him, we would not have had these architectural marvels. An entire Purana, called the Samba Purana, is named after him. This is proof enough of his great power.